My choice is a painting by Josef Carl Berthold Püttner from the 19th Century. 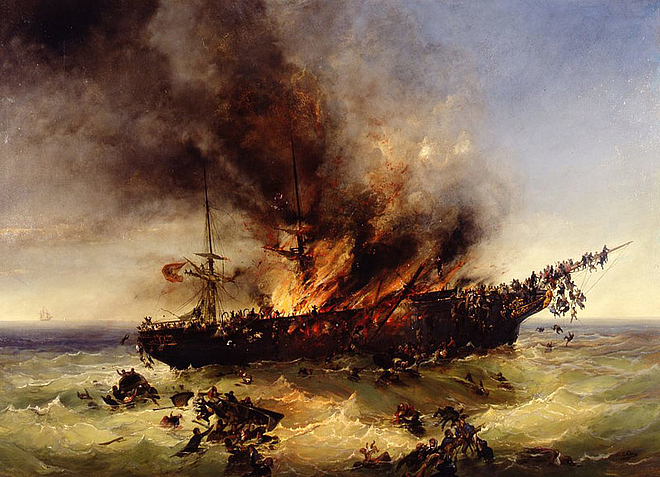 It depicts the emigrant ship "Austria" on fire, a tragedy that occured on 13 September 1858. One can see people desperatedly trying to save their lives, overloaded boats sinking, horrific scenes based on true events during that time in Europe, a time of suffering, poverty, and unemployment, and also political persecutions. Between 1850 and 1870 about two million people emigrated from the German Confederation to the USA, Canada, South America, even New Zealand. The fire on the overcrowded "Austria" ship was caused by imprudence. Of the 542 passengers, only 89 could be rescued. When I now guide the Multaka-tours through the museum, whenever I am with a group of visitors talking about that painting, they immediately recall their own journey, and start recounting what they went through, and how they got here, all sad memories and many tears. But hope is always there, when we see what a country like Germany has witnessed over the centuries, going through many difficult times, but being today a really good place to live in, a place where everyone is respected and rights are protected, a place where you can study, work, have a family, and simply live. This all gives us hope that war will be over some day, and things will be good again in our own countries. Born in 1994 in Syria. Studied Tourism in Damascus. Came to Berlin in 2014 with part of her Family. Since 2015, she is a Multaka guide in the German Historical Museum. Also, she works as a translator from German language into Arabic in a camp for refugees.